(Nanowerk News) Corannulene is a carbon molecule with a unique shape (similar to the better known fullerene) and promising properties. A team of scientists from SISSA and the University of Zurich carried out computer simulations of the molecule’s properties and discovered that it might help overcome the difficulties building molecular circuits (i.e., of the size of molecules). The study has just been published in Physical Chemistry Chemical Physics ("Buckybowl superatom states: a unique route for electron transport?"). A unique paradigm for intermolecular charge transport mediated by diffuse atomic-like orbital (SAMOs), typically present in conjugated hollow shaped molecules, is investigated for C20H10 molecular fragments by means of G0W0 theory. Imagine taking a fullerene (C60) and cutting it in half like a melon. What you get is a corannulene (C20H10), a molecule that, according to a just-published study conducted with SISSA’s collaboration, could be an important component of future “molecular circuits”, that is, circuits miniaturized to the size of molecules, to be used for various kinds of electronic devices (transistors, diodes, etc.). Fullerene is a very popular molecule: also called buckybowl, it is formed of carbon atoms arranged in a hexagonal network shaped like a hollow sphere. It is an intensely studied material that displays interesting properties in different fields. Even though C60 is known to contain “empty states” (of a very special nature known as buckybowl superatom states, BSS) capable of accepting electrons, these states are found at very high energies, a feature that makes them difficult to exploit in electronic devices. The electrons in electronic circuits have to be able to travel easily. “In fullerene the energy levels of the BSS type capable of accommodating ‘travelling electrons’ are difficult to achieve energetically”, explains Layla Martin-Samos, researcher at Democritos IOM-CNR and SISSA and among the authors of the study published in Physical Chemistry Chemical Physics. “Corannullene, on the other hand, seems to be much better suited to the purpose, as demonstrated by our calculations”. 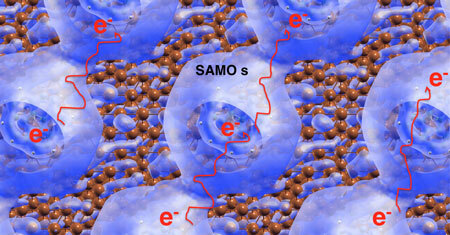 Martin-Samos and colleagues had already studied the optical properties of this molecule. “This time instead we focused on its electronic properties with special emphasis on the study of BSS”. The observations - theoretical and based on computer simulations – of Martin-Samos and colleagues show that BSS in corannulene are found at much lower energy levels compared to fullerene and can therefore be more easily accessed. “This makes the material an excellent prospective candidate for the construction of electronic circuits” continues Martin-Samos. “In fact if we put corannulene molecules next to one another in a row, the electrons will flow easily from one to the next, forming a sort of tunnel which makes up the circuit”. “Our work not only uncovered the potential of this molecule, but it also served as a guide for the subsequent experimental analysis, by indicating where and what to look at and reducing the time and cost of the experiments. The investigators have recently finished collecting the experimental data and are now going to start their analysis to verify experimentally what we observed in our simulation. We’re keeping our fingers crossed: who knows, in a few months’ time we might be celebrating”.